These little guys are jucotes and they are popular with kids (likely) due to their biitter and somewhat sour taste. They have the texture of a not quite ripe apple when you bite into them. Don't bite down too hard or you will quickly meet they big hard pit that is easily half the fruit. No it's not an artichoke, it's an annona. An annona is a fruit that comes from the sugar apple family and not surprisingly it tastes somewhat like a gooey, sugary apple but the seeds are spread throughout the entire fruit. This is not a weapon, but uncooked probably could be used as one. It is a wiskil and they are a staple in our house. They come in two varieties, white and green. The white ones taste a lot like potatoes and the green ones taste more like squash. We eat the green ones weekly. You boil or steam them before eating. When this is done, the spiky outer layer peels off. Inside is an orange colored meat that smells and tastes a lot like pumpkin. The biggest difference is that it has two very large seeds. Like pumpkin seeds, they can be cooked and consumed (we've not tried this yet). We only tried the meat and no one in the family was a fan. In fact, the kids refused to eat it and Mick spit it out. 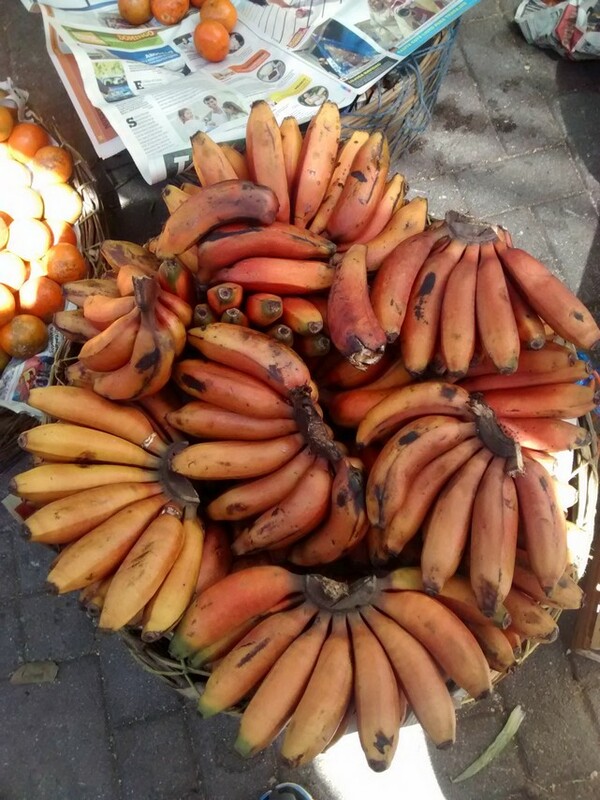 These red or sometimes called pink bananas are generally called maduros at the market. They are a different variety than the common cavendish banana which is the most common variety sold world wide. The darker the color, the more ripe they are and the sweeter they taste. Mick and I enjoy its smaller size and sweetness. The kids claim they don't like them, but they didn't notice any difference when we put them in their smoothies. This bright colored fruit is called a canary melon and I had to convince Tag that it was not a ball for him to throw or kick. Inside it looks, smells and tastes like the perfect combination of a honeydew and cantaloupe. We just had it this week for the first time and will definitely get another soon. The kids loved it. I didn't include the popular nicknamed "booger" fruit, but that's because it deserves its own post. More on that and other foods to come.